Virgin America announced today at the Global Business Travel Association Convention that its Elevate frequent flyer program will now include a two-tier elite status component starting August 8, 2012. 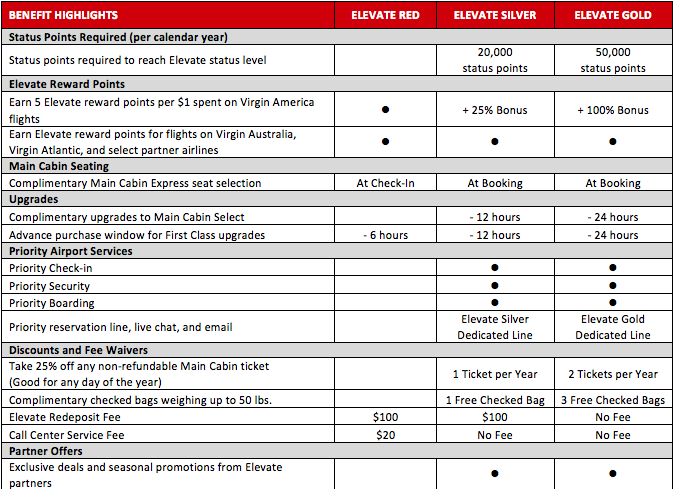 Virgin America’s chart explaining the benefits of its new elite status tiers. Elevate members who earn 20,000 Elevate status points ($4,000 in flight purchases) within a calendar year will get Silver status, while those who earn 50,000 status points ($10,000 in flight purchases) in a full calendar year will achieve Elevate Gold status. Elevate status points can be earned on purchased flights with Virgin America, Virgin Atlantic and Virgin Australia. Points earned from the Virgin America Visa Signature card do not count. Travelers earn 5 Elevate points per $1 spent on travel on Virgin America itself, though they earn points based on fare class and the distance of the flight on partners Virgin Australia and Virgin Atlantic. The final cherry on top? The Elevate member who earns the most status points between August 8, 2012 and August 7, 2013 will earn a reward of a sub-orbital space flight on Virgin Galactic, which is a $200,000 ticket. I’m happy to see Virgin America enhancing it’s loyalty program and some of these perks are pretty valuable, which some are yet to be seen (like the social media bonuses, which are an interesting perk I haven’t seen another airline introduce). This isn’t a game changer for me, because I still value traditional airline miles and the elite status perks of my American Airlines Executive Platinum and Delta Platinum statuses more than what Virgin America Gold would offer me, but this is a nice way to reward their top customers who not only fly a lot – but spend a lot. Elevate points are fixed value, so you can redeem them for any flight at about 1.6-2.1 cents apiece. It’s a solid program considering you earn 5 points per dollar spent – plus an additional 3 if you have the Visa Signature card plus up to a 100% elite bonus. In essence you could be getting back 26% or more of your spend if you are a Gold elite credit cardholder. So that $10,000 spent a year to achieve Gold status could mean up to $2,600 back in award flights- not so shabby. I’ve never flown Virgin America, but most people who do absolutely love it. Feel free to share your experiences or thoughts on their new elite program. If you have any specific questions, we are talking to Virgin America’s loyalty program director tomorrow, so ask away and we will get your questions answered.